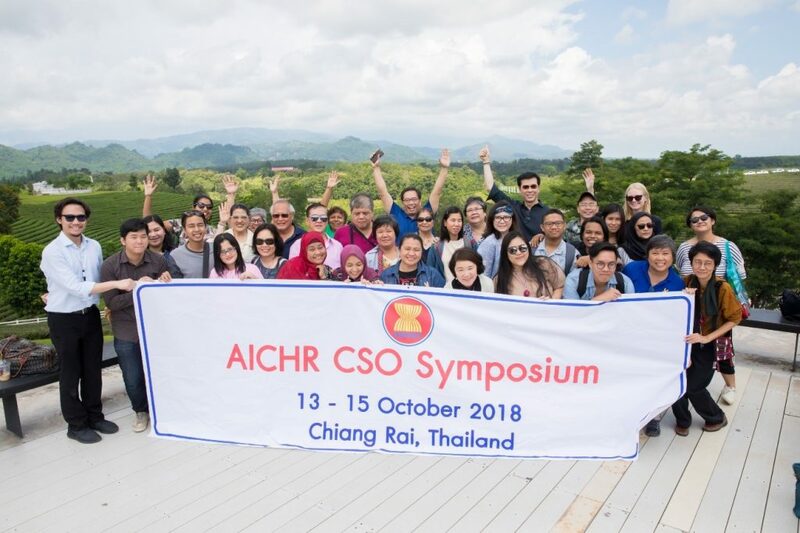 On 13-15 October 2018 AICHR held CSO Symposium 2018. 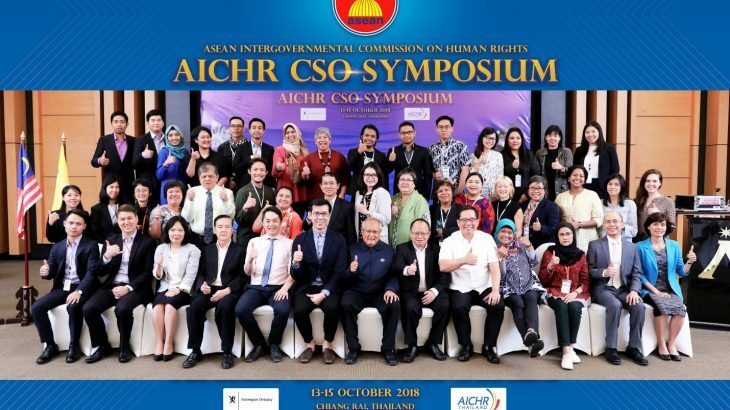 The forum, aimed at furthering communication and coordination between the Commission and its counterpart ASEAN bodies and other relevant organizations, was attended by the AICHR Representatives as well as delegates from 20 civil society organizations with consultative relationship with the AICHR (accredited CSOs), including the Human Rights Resource Centre (HRRC). Additionally, representatives of the ASEAN Commission on the Promotion and Protection of the Rights of Women and Children (ACWC),Senior Officials Meeting on Social Welfare and Development (SOMSWD). National Human Rights Institutions (NHRIs) from ASEAN member states, and some UN agencies (UNDP and UNESCAP) were also in attendance. H.E. Amb. Barry Desker, AICHR Representative of Singapore and current Chair of the Commission in his welcome remarks underlined the significance of the forum as part of AICHR’s larger efforts to engage more actively with CSOs in its programs and activities, including seeking CSOs as resource persons for its events. He reminded all in attendance that the symposium was expected to further vigorous discussions between the commission and the organizations represented by the participants. The discussions ensued were lively, focusing on the rights of women and children and people with disabilities in the region. Additionally, it covered other urgent human rights issues including trafficking in persons, business and human rights, and environmental protection. On the second day, AICHR Thailand organized site visits to showcase civil society efforts in integrating development, human rights, and environmental sustainability to achieve Sustainable Development Goals (SDGs). During the visit to Ban Pha Mee Efficiency-Tourism, Choui Fong Tea Plantation and Singha Park, Wat Rong Khun, the participants learned how the principles of human rights and environmental preservation are applied in tourism and agricultural commercial ventures. The symposium was closed on the third day. As the host, H.E. Dr. Seree Nonthasoot, Representative of Thailand to the AICHR, encouraged all to take note of the progress in human rights discourse in ASEAN. He raised as an example the issues of human rights defenders and torture, which had been considered as taboo topics in previous years. However, he conceded that there remained to be areas that could bear more improvement for AICHR, such as the rights of convicts and freedom of religion. He also pointed to the Symposium as a sign of progress, noting that it had taken three to four years to secure the necessary arrangements and agreements for AICHR to reach such level of engagement with CSOs. H.E. Dr. Seree Nonthasoot also thanked the Embassy of the Kingdom of Norway for its support in the organization of the event. ACWC, AICHR, ASEAN, News, NHRIs, SOMSWD, Thailand, UNDP, UNESCAP ACWC, AICHR, ASEAN, NHRIs, SOMSWD, THAILAND, UNDP, UNESCAP. permalink.